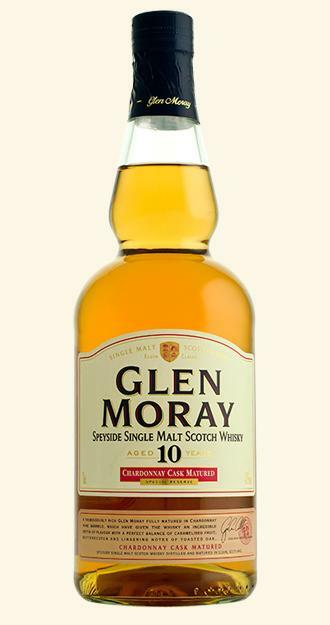 Glen Moray 10 Year Old Chardonnay matured. Proving Value for money does exist. Glen Moray must be one of the most underrated distilleries which currently produces spirit. Underrated and under the radar and, dare I say it, slightly unfashionable? The standard NAS Single Malt you’ll find in many supermarkets including Aldi and they also have a superb peated version and both can be bought for around twenty quid, in fact the standard version is sold for sixteen pounds in Aldi and if you can find me a better Single Malt for that price get back to me, please. There are several other Glen Moray which are available online or in a few specialist retailers but those two are available all over the place. Here we are though with the 10 year old Chardonnay Cask which has recently hit the supermarket shelves, I know both Tesco and Sainbury’s are selling it for around twenty five pounds, which is very good value so much so I bought two bottles of this, one for now and one for a few years down the line. This is bottled at 40% and is decent neat and a little better with a drop of water which is how it’s reviewed. Nose. Light and fresh, crisp green apples, orange zest and pears, and strangely enough, a touch of white wine and oak. Palate. Caramel and Red Kola, Barely sweets, Lemon juice, vanilla cream, there is also some oak too but the wine feel is a lot more on the nose than in the mouth. Finish. Rich and creamy, a little touch of white pepper and some hazelnut. This is a very good whisky, especially for its money, in a age where we are getting so many over priced and over hyped whiskies. If this whisky was forty pounds I’d say try before you buy but for this price it’s just excellent, well done to Glen Moray, I will attempt to pick up bottles of the Peat and standard versions so I can review them over the coming months. Previous Like a Gungdo bolt to the senses. It’s time for some South Korean oak aged rice Spirit. Next Haig Club Clubman Single Grain Whisky 40% Review.